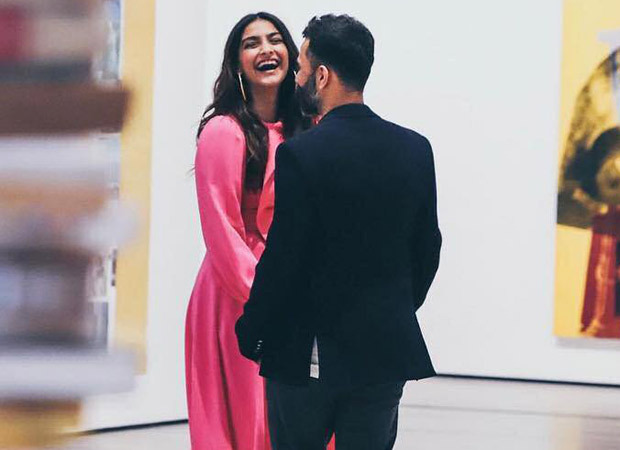 Sonam Kapoor Ahuja and Anand Ahuja are one of the cutest couple of B-Town. The two have recently tied the knot and are always raising the bar high for Instagram goals. The couple looks absolutely smitten by each other and they can’t stop smiling in each other’s presence. The one thing we love the most about them is the fact that they do not shy away from being goofy and adorable in public! Anand and Sonam have been sharing quite a few pictures from their trip to LA and they are just beautiful. Just yesterday, Anand Ahuja posted a video of Sonam Kapoor Ahuja grooving to the 80’s hit track, Jimmy Jimmy, from the movie Disco Dancer. The movie starred Mithun Chakravarty and is still one of the iconic films of the industry. A total trend setter, this song after 3 decades is still the best dance number there ever has been. Sonam Kapoor is seen wearing a white top with black flared pants as she dances her heart out to this track. That is exactly how we plan on getting through the week! The good ol’ Bollywood numbers and some crazy dance step, we love the mood Sonam has set for us. On the work front, Sonam Kapoor will next be seen starring in The Zoya Factor opposite Dulquer Salman. She was last seen in Ek Ladki Ko Dekha Toh Aisa Laga, a ground breaking film that showed the difficulty a LGBTQ goes through while coming out of the closet especially in a traditional Indian family. Ek Ladki Ko Dekha Toh Aisa Laga also marked the first time where Sonam shared the screen space with her father, Anil Kapoor. How do you like Sonam’s moves? Let us know.